I rode up to KL and back twice earlier this month. And on both occasions, it rained. No. It poured. But thankfully, in both occasions, it was short bursts of heavenly blessings, and the sky quickly cleared. Possibly just a passing cloud. And when it cleared and as I rode on, the 120kmh wind had a cooling and calming evaporative effect that quickly dried me up. Well, except for my rain water saturated socks. I wore non-waterproofed sneakers on both occasions, mainly because I didn’t want to bother to bring another pair of shoes along to change into when I got to KL. And when the rain passed, my feet remained mushy and soggy from the water ingress. Not a very nice feeling. On hindsight, I should have at least don my pair of SAF military boots – which would have minimally kept me dry. And while these military grade leather boots offers great abrasion resistance, they don’t offer much impact protection. And so, the kia-si touring lover in me decided to scout for some riding boots to save my feet in the event of a fall. There were a couple of things I was looking out for in a pair of riding boots. Firstly, I don’t want it to look like something I’d wear to outer space. Many “racing” boots, while having excellent protective features, look too gaudy alien to me. I don’t race. I don’t want to look like a racer too. Mainly also because I know that any decent sports bike is gonna outrun my humble 200cc single-cylinder 4-stroker if challenged to a race. Definitely not good for my ego. Next, I was looking for something that’s easy to slip on and slip off. Not something so tall that I’ll have to take 10mins to put it on or take it off. So something around ankle-height. Maybe a mid- to mid-low cut. Thirdly, I want something with great paddings, comfortable enough to walk around town in (so that I have the option of not having to carry an extra pair of walking shoes), and look like something closer to a pair of walking shoes than riding boots. And finally, it must be waterproof – of course! So after shopping around, I narrowed to 2 possible choices. The TCX X-Cube Evo Waterproof ($200 from MotoWorld) and the SIDI Mythos Gore-Tex (also $200 from Chong Aik). Actually, I really liked the design of the SIDI Doha, as these look casual enough and have that hiking boots look that I was looking for. Unfortunately, they weren’t waterproof – so no go for those. The TCX X-Cube Evo is a mid-high cut pair of boots. It checked all the right boxes – waterproof, CE certified, has a non-slip sole by Michelin (supposedly trying to give the rider the impression that the boots are as planted to the ground as the Michelins are on your bike), and importantly, at just about the price point that I had budgeted for. 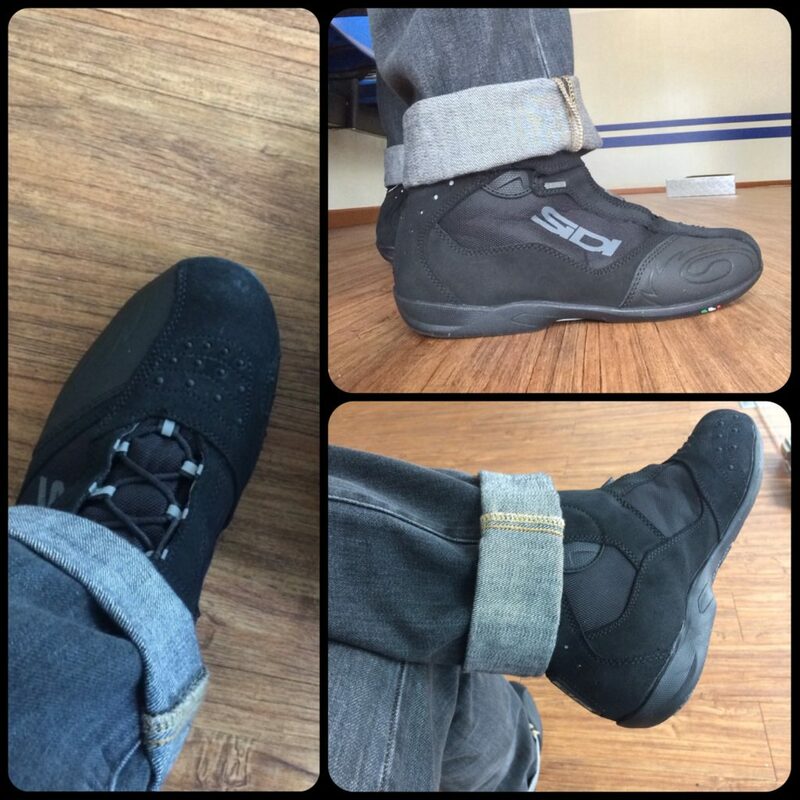 The SIDI Mythos Gore-Tex on the other hand, is a mid-low cut riding boots. So it’s probably a tad bit easier to slip on and off with these. Made of SIDI’s classic suede and material by the world famous waterproof, yet breathable fabric – Gore-Tex of W.L.Gore and Associates. And between the two, I actually liked SIDI’s design better. So it was a really tough choice between the 2. And when I did some further online research, I discovered 2 things which made my decision so much easier. First, between the two, while reviewers of both camps rave about the respective boots, it seem that the TCX can get a little warm in hot weather. Online reviewers seem to suggest that SIDI’s Mythos breathe easier and are comparatively cooler in warm weather. And so with the all-year-round warm weather we experience in this part of the world, it was rather easy to lean towards the SIDI’s. And finally, the thing that sealed the deal for me was this – while both the TCX and SIDI were going for $200 from MotoWorld and Chong Aik respectively, there were going for USD179.99 (approximately SGD240) and USD224 (approx SGD300) respectively on RevZilla.com – a respectable online motorcycle accessories retailer based in USA. It isn’t often that we can get suff cheaper here in Singapore than what we could have gotten from a US online shopping site sent to a US postal address on free shipping. And $200 for the Mythos from Chong Aik compared to almost $300 from RevZilla USA, it looked like I didn’t have to think too much further! 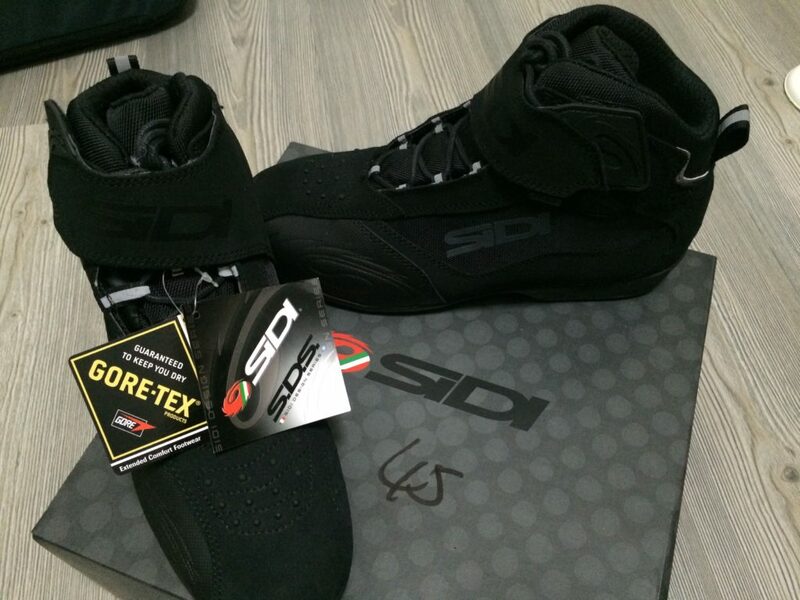 Oh, and for those who may be interested to get the SIDI’s, you might want to do it real soon. According to the girl from Chong Aik, they’re gonna be raising their prices sometime next month. Can’t wait to try these new babies on! Update: I’m still trying to wear these boots in, but I think they look not bad at all with black jeans! The boots have been tested great for waterproofness? Thanks for the review.